I had the good fortune to spend much of the ATIA conference this year in the company of international delegates in my role as International ambassador. For those who have never been ATIA is a major US conference devoted to the AT industry with over 300 seminars, a major exhibition and over 2000 delegates. The days are long with sessions starting at 8am and events running until 7.30pm, and that's when the informal networking starts ! It is the very scale of what is available that can seem daunting. For those flying from Europe, Middle East and the Far East some support to get the most from the event is appreciated. One of the first things we encouraged new delegates to consider is registering as a speaker. Whilst this might sound onerous, there is no better way of finding fellow delegates with similar interests, it is very usual at the end of sessions to find the speakers and their audience arranging times to continue conversations and discussing potential sharing and networking for the future. Take plenty of business cards ! Once registered as a speaker, you will start to see the conference program emerging, and at this point a little help in understanding some of the sessions and choosing those that really helped hit the aims of attending was appreciated. One of the interesting things is that a terminology begins to emerge around conferences, buzzwords and jargon can sneak in, and understanding what some of that means makes decision making a,lot easier. What exactly is the difference between a Bootcamp, a town hall and an unconference, the terms can appear a little daunting. Knowing what you really want to achieve in attending is very helpful at this stage, it is also a good time to start to apply for visas, leaving the application late can cause last minute problems and event an inability to travel. Fortunately ATIA were very helpful and supportive of those whose visa requests were rejected. So at this stage we have planned to go round the exhibition and have filled the diary with seminars, when the opportunity to meet with other delegates emerges. One of the main reasons to attend ATIA is to network with like minded professionals, and there are a lot of them!.Setting up those meetings, brokering introductions and helping make the most out of every minute our delegates were attending was our objective, and we seemed to achieve it. So we are starting work on ATIA 2018, it will soon be time to promote the call for papers and im looking forward to continuing the role in 2018. Why not think about joining us, Ill be there to help! In discussing how to meet AAC needs in Pakistan it is important to understand the size of the country, much larger than most of us from the west anticipate. That has significant implications for how services can be delivered. In a country where the rights of people with a disability are recognized, but where there are major barriers to delivering upon that commitment the need to share best practices across the country is a constant challenge. People do rise to that challenge, after it was announced that both EA Draffan and would I be in Pakistan, a number of people thought nothing of driving for four hours to engage and discuss ideas despite fog and crowded roads. There was a passion and interest in the work - a half day public event on disability and communication drew 1500 people to an events marquee in Islamabad. They heard from those of us from the west about best practices and examples of the impact of technology, but also listened intently to politicians and religious leaders share perspectives and ideas. Above all the theme emerged that we must, and can do more. Outside of the large public event, we delivered some in depth training on aspects of AAC provision to Speech and Language therapists locally. EA explored the concepts of AAC, investigating how assessment can take place and I added to this by exploring the continuum of technology devices and how we can use those devices to stimulate communication in a purposeful manner. From those discussions we identified some common issues to consider. We recognized that addressing these challenges not only required a commitment by all members of the team, but also policy and actions from service managers to incentivise team members to apply AAC programs with the therapist was not present. The availability of technology with which learners could develop,practice and generalize their communication skills was a real barrier to uptake of AAC in Pakistan. Much of the equipment was based around simple hardware devices such as a big mack or gotalk. These were easy to use, reliable and used digitised speech making recording and speaking messages in Urdu easier. There was a great deal of interest in the availability of low cost AAC apps, especially for Android platforms which are far more pervasive than Windows Phone or iPads. As we spoke, it seemed unlikely that the market in Pakistan was large enough to attract the interest of western AAC manufacturers, especially as there were some technical limitations to localising apps to support Urdu. As a result, it was clear to us that the challenge of providing AAC apps in Pakistan had to be met from within Pakistan. Relationships between therapists, services, researchers and developers needed to be nurtured to bring products to market. Who would lead that effort needed to be clarified and acceptable to all. To develop the technologies required to meet the first two needs, it was clear that researchers needed to be encouraged to enage with the issue. There was great consensus that this could best be done by the government funding the development of the technology under open source licence to support developers of AAC solutions and reduce the cost of the final products. On the third point, there was considerable discussion about taking the Tawasol Arabic/Islamic symbol set and modifying the symbols for the culture of Pakistan. Pakistan is an immensely rich culture, I was taken to see hugely colorful locations, and clothing worn by many women was bright whilst modest. Similarly the clothing of men was different to those we had depicted in the Arabic symbol set. But despite this, many felt that the symbols provided a much firmer starting point for the creation of a Pakistani symbol dictionary than western symbols and that the availability of the Tawasol set under a very broad creative commons licence was welcomed. These themes were reflected when I had the opportunity to visit a child development center in Rawalpindi. Whilst meeting members of the teams delivering AAC and discussing how it was being provided for individual children, the limitations we had discussed the day before were apparent. There is no lack of commitment or passion in Pakistan and there was evidence of a strong foundation of knowledge in Islamabad, the challenge is to provide the resources and technology which unlocks that potential. On a personal note, I should describe how welcome I felt in Pakistan. I had great pleasure in meeting people, there was a willingness to debate the way ahead and everyone that I met took time to help educate me about the culture of the country and the experience was personally fulfilling. If others get a chance to visit, take some pleasure in it, enjoy the beautiful mosques, but visit the preserved sites sacred to Buddhists, Sikhs and others, prepare to be challenged and to engage in debate with both men and women. Take pleasure in the beauty of the country, and try to understand the economics and culture to help bring access and inclusion to all. World Autism Awareness Week - After awareness what can you do ? This week marked World Autism Awareness Day – it’s become a major global initiative that has been hugely successful in increasing awareness of Autism. I have some mixed feelings about how autism is portrayed in the campaigns having spent much of my early career working with young people with very deep and profound autism, but one cannot deny the success of the campaign in changing attitudes. But once you have created an appetite for making change on behalf of people who are on the Autistic Spectrum, you need to fill the demand of information on approaches that it generates. AIM the autism internet modules - http://www.autisminternetmodules.org is an amazing resource developed by OCALI. AIM is designed to provide high-quality information and professional development for anyone who supports, instructs, works with, or lives with someone with autism. Each module guides you through case studies, instructional videos, pre- and post-assessments, a glossary, and much more. AIM modules are available at no cost. If you would like to receive credit for your time on AIM, certificate and credit options are available for a fee. Personal Mobility is changing, and we are approaching a period where our current concept of wheelchairs will feel as outdated as crossing the Atlantic by sailboat. Two significant trends are emerging that will see the business of the provision of powered mobility aids being one that will be subject to significant disruption. The first is obvious, more people are acquiring wheels. Every time I walk through a park, go to a mall or stroll along our seafront in Doha its remarkable to see how many people now use forms of powered mobility. People have always used wheels for personal mobility, bicycles, skateboards, skates have been available for many years. But in recent years these have been enhanced with powered solutions. It started with the Segway, beloved by city tours and security guards, the upright device can be found around the world, although it is perhaps not as ubiquitous as the “hoverboards” that emerged world wide as a toy and leisure activity over the past 18 months. As I walked through our local park a few weeks ago I dived for the grassed areas to avoid the youngsters on powered bicycles and they sped along the paving. Powered personal mobility is moving into the mainstream. But this trend is being contradicted by innovation by research and commercialization of exoskeletons, the technologies that enhance our current physical abilities and which can operate in a wider range of environments than any wheeled device can. It is not my intention to enter into the debate about where funding should be prioritized, towards environmental access adjustments or into research, I tend to believe that both are needed to provide for both current and future needs. I don’t accept the argument that human augmentation is necessarily simple an attempt to repair or “fix” the person, both wheelchairs and exoskeletons can be seen from within a social context, they are both technologies that provide a means by which needs are accommodated within the environment. There is a strong parallel with assistive technologies here. The user needs assistive technology (screen readers, keyboards, switches, joysticks etc) but also needs accessible content (websites, apps, ebooks etc). Within the built environment the user currently needs personal technology (wheelchair, scooter, smartcane) alongside an accessible environment, (curbcuts, ramps, tactile flooring). Access currently is dependent upon both factors interacting. Increasingly it appears that the need for environmental change may fade, not overnight, not immediately, but over time. Instead we will see new technologies empowering the user to have control over their mobility in new ways. We should and can stimulate and embrace that shift but to do so at the cost of people currently living with a disability may be too great a cost. So this time next week I will be on a plane bound for Florida and ATIA 2016 - I do often get asked for recommendations for those who can only get to one conference a year, and this is usually my number one choice. First it covers the broadest spectrum of needs, autism, physical, sensory needs are all covered. Second it has a diverse exhibition and is attended not only by sales people but senior manages of companies as well, Third it has a huge workshop program that is predominantly practitioner driven and hence practical. Finally it is very welcoming to overseas visitors, it does no harm that if you can take a couple of days leave you are only a few miles from the best theme parks in the world. It would be a real pleasure to meet anyone who is attending and catch up face to face, let me know if you will be there. This is a really interesting piece by my friend Damien Radcliffe on Social media use within the Middle East - it tells an interesting story which deserves some time to think about. Fundamentally we see a significant growth in social media based upon visual content (images/video), growth in social media that uses limited amounts of text, an growth of social media where your personal networks can be secured. So we see lots of use of Snapchat, Instagram and WhatsApp and a shift on platforms such as facebook to using images and video and less text. This is interesting in an era where engagement with social media is a defining feature of social inclusion, and the story is variable. For those who are deaf this is probably a positive step - recognizing the relatively low levels of literacy within the community, but for those with a visual impairment we can see the potential for a new digital divide to emerge and hence possible greater social exclusion. Its interesting to see how the advent of touch devices has changed some of the world of Assistive Technology. One of the areas which has felt that impact has been the use of switch technology for people with physical disabilities, as there has been the growth of an assumption that touch screens are "a bit like using a switch"
The truth is quite different, the skills and abilities to use a touch device, notably accuracy and cognitive sequencing are quite different to the levels required to use a switch, and of course switches can pretty much use any intentional movement, to establish control over technology. So I was really pleased to find this little booklet on switches via my Pinterest page - its a valuable guide to how to use a switch, what switches are available and how to mount them etc. The Kindle Fire, changing the gameplan for access ? The new Kindle Fire was released this week to a fascinating mixture of responses, pundits thought it was great, apple Fanboyz derided it and the blind community attacked its lack of access for the visually impaired with righteous indignation and anger, this following the same community lauding Steve Jobs for apples work on providing access. I dont know to what extent the community has had its hands on the kindle fire - many of the pundits were not able to get hands on, but lets assume that the new device has little or no TTS functionality. Which leads us to our debate around accessibility, whilst we may well be annoyed that such a new and low cost device does not have full screenreading functionality, this may well be the wrong debate. Our question perhaps should be, is the content that Amazon distributes, available to all people regardless of needs. Kindle has a hugely diverse range of channels to its content with software (free) for every major platform to read content as well as the traditional reader and now the Fire. I havent tested all of these but Im going to look at which of these work well with screenreaders and offer support to blind and people with low vision. Because perhaps the debate now should perhaps be - does Amazon (or apple or whoever) offer access to the same content for no greater cost than a person who is not yet disabled in anyway ? This is more or less the case for other forms of accessibility, access to a building doesn't require that every entrance has a ramp, access to disney rides doesn't require that every cart is wheelchair accessible and access to the cinema doesnt require that every seat is removable for wheelchair access. In all cases there is a compromise that is being offered. I imagine that the first response Im likely to get is that all people should be able to use all channel as a matter of having a range of choices. Im not entirely convinced by this, my choices are limited by a range of factors, including cost, but also my language, my age (and increasingly weak hearing and sight) and my location. Like all users I have to weigh up all of these factors in making a decision and it may well be that other members of my family would opt for a different way of accessing Amazon to the one that suits me. I do understand the frustration of the blind community, but the debate needs to be mature. The Kindle Fire may not be a solution for people with a visual impairment, I dont know - what I do know is that a lightweight reader for books and other media is helpful for people with conditions such as arthritis, a simple touch and go interface works for people with learning difficulties or seniors and that Amazon content with subtitles is a valued service for the deaf. Amazon needs to savvy up to these issues and be clear on the routes it is offering to its content for people with a variety of needs, but perhaps those of us in the accessibility world need to be thinking increasingly of promotion of access to content across a matrix of options, rather than each device independently. Earlier this year I had the opportunity to travel to Orlando in the American state of Florida for a major assistive technology conference. The conference was a success despite the hotel catching fire and a tornado touching down in town whilst I was there: never a dull moment in the world of access technology! But access to technology conferences are not what take most people to Orlando. Most visitors travel to visit some of the world’s best theme parks and I was no exception. I visited Disney’s Magic Kingdom and left impressed with how Disney has risen to the challenge of turning a 47 square mile attraction, into a visit that anyone will remember, regardless of whether they have a disability or not. Upon my arrival, I was greeted by key personnel working on access issues at Disney. Before taking me on a tour of the park, they gave me some of the history to Disney’s commitment to making a visit magical for any visitor. Early photos of the park show Walt Disney himself greeting children in wheelchairs as they take a tour. This established a culture of accessibility from the early days of the internationally acclaimed theme park. Most people visit Disney World to go on the rides. They are a huge part of the experience and without them visitors might feel that they had missed out in major way. Across almost all rides, great care was taken to think about how users with disabilities would board, be seated and leave the ride. Special pods had been design on many rides which allowed wheelchairs to enter the ride directly without the need to transfer to different seating. If a transfer was needed, the employees or “cast” as Disney likes to call them, could halt the ride to allow extra time. In more recent times this had changed, by creating an additional loop on rides where pods for disabled guests could be withdrawn from the ride without the need to stop the ride, rejoining the ride as the gap in the succession of pods came around again. It was a great feature which allowed guests with a disability to take all the time they needed boarding, without disrupting the experience of others and without feeling that they were being “judged” by other guests as they got on board. Even with the design of pods for users, there was still a need to help people with a disability to feel confident that they could easily board and disembark without a problem. Disney had invested in a ride where people with disabilities could practice getting on and off the ride, increasing their confidence when they got to the front of the queues for real. Disney World is big. There are multiple parks spread across 47 square miles, and getting from one park to another requires a huge complex public transport system which includes buses, trams, and a widely used monorail. It would have been easy for Disney to have adopted an “equal but different” approach where special transport was available separately for people with a disability, but such approaches always struggle with availability (have you ever tried to get an accessible taxi in Doha?) So instead, the public transport system at Disney World was designed to allow people with disabilities to use the same modes of transport as everyone else. Buses had low loading access, monorails had space for wheelchairs and these carriages were clearly marked so that you could find them easily. The result was that people with a disability were as mobile between parks as they were within them. And with sidewalks with multiple curb cuts, it was easy for chairs (and baby carriages) to get around the attractions. Once you were in the park, it was easy to get lost – did I mention that Disney was big? A key point around Disney World was there were usefully situated maps of the park you were in. Such maps were useful to any guest, especially in the rain when your free paper copy turns into pulp very quickly. The maps were carefully designed to include key labels available in both Braille and with universally understood symbols and icons. Good designs for people with a disability helped everyone, from those standing with a sodden map, to those with limited use of English who could easily understand the icons and symbols more than words. Technology is at the heart of the Disney experience, not only in the future themed Epcot Center, but as an integral part of every ride you visit. From the cute animatronics of “It’s a Small World” to the smells, sounds and images of “Pirates of the Caribbean,” technology makes these experiences more vivid and memorable. So perhaps it is no surprise that this experience has been brought to bear on maximising the experience for people with a disability. Upon arrival at the park, a disabled guest can request a personal PDA to carry around with them. The PDA will provide the user with captions or audio descriptions for shows and rides they visit. The descriptions explain to a blind user what the sighted person can see around them, integrating with the music, smells and effects on the ride. The captions synchronise with a show to give instructions or storyline for a deaf person. It’s a great, non intrusive experience that makes rides truly accessible. But the devices go even further than this. They also help a disabled person to locate themselves in the park by a combination of GPS, RFID, Infrared and Bluetooth technologies that trigger messages as you wander through the park. The messages explain where you are, what is around you and what routes you should take to get to other great rides. As a non disabled person I wanted one of these as well, and it was great to hear that Disney are exploring how to make this information available via a mobile phone rather than needing a specialised device. However, maybe the most impressive part of all of this, was not the technology, the investment or the commitment, it was that every cast member I met knew about it and knew how to make it all work. Need to know how to get on a ride in a wheelchair? Just ask! Need to know about tactile maps and accessible transport? Just Ask! Need to know where to get a loaned wheelchair or way finder? Just Ask! Now that is impressive, and it demonstrates a real understanding at Disney that providing solutions is not enough if no one helps people to use them. Despite all these great features at their flagship theme park in Orlando, Disney isn’t perfect. it knows that they have work to do on making web information accessible to all, to making booking systems easier to use for the blind and for people who use keyboard control only, but to their credit they don’t brush these issues under the mat, they seem to have a plan, the commitment and the investment to address them. They know that as Disney changes and evolves, so do the ways in which access for all needs is to be delivered. So what can we learn from Disney? What I took away is that creating a truly accessible environment is a long term plan, and one which needs constant renewal as technology changes and the opportunities for access and aspirations of disabled people grow. It has taken 11 years of commitment for Disney to get where it is today, and that journey isn’t over yet. 11 years? That’s an interesting figure for us in Qatar as we lie 11 years away from 2022, when Qatar is set to host the FIFA World Cup. Is it just possible that as the country responds to the challenges of the delivering an amazing World Cup in 2022, that we might also develop a plan and an infrastructure that means that any disabled person in Qatar, citizen, resident or guest will look back and remember the magic as well? I think we can, but that journey needs to start today because 11 years is no time at all. Thanks Mickey for reminding us what is possible! People all around the world will be celebrating the 5th birthday of Twitter this week. Here in Qatar, tweeps (term used to describe Twitter users) will be getting together at Aspire Park for the Doha Twestival. Like many others I can’t remember how exactly I worked prior to Twitter. How did I keep up to date with the latest trends in my field? How did I gather information for newsletters and podcasts? How did I find out what my favorite celebrities were thinking? Of all the social networks that I’ve joined, and there are many, Twitter remains my favorite. But I want to congratulate Twitter for completely different reasons. My work involves me finding ways of meeting the needs and aspirations of people with disabilities. What I have been told often is that people with a disability want to be connected, to be part of a community, and I am happy to say Twitter has offered an opportunity to do so. People with disabilities need access to technology, but they also need accessible technology. Many social networks haven’t designed their platforms with accessibility on their mind. Popular Web 2.0 sites don’t work for people who can’t use a mouse, people who can’t see a screen or for those who use one of the myriad of Assistive Technologies (AT) such as those you find at Mada (Qatar Assistive Technology Center). Twitter did something different. It allowed developers to create a range of different software to access the service (eg. Tweetdeck, Tweetie, Ubertwitter, etc. ), much in the same way as we can use different ways to send and receive email, and that decision had a big impact on people with disabilities. A great way for people with disabilities to access Twitter! In 2009, Accessible Twitter was launched. Dennis Lembree the man behind Webaxe blog (Podcast and blog on practical web design accessibility tips), launched the service as an alternative to the main Twitter website. Andy Bryant, tech pundit, summed up Accessible Twitter in 2009: “You go along to the homepage, log in with your usual Twitter account details, and use it in exactly the same way as you would the regular site. All the functionality that you’d expect is there – the Tweet roll, your status, mentions & messages, plus access to search, trending topics and popular links.” But unlike the original Twitter – this one was accessible. It could be argued that Twitter should have been accessible from day one. In fact, it is hard to argue against that, and Accessible Twitter shows us how mainstream applications can be designed to support everyone. But perhaps it also shows us another route, based on a more free form style of development. We are all increasingly using different ways of accessing online services, through phones, computers and even digital televisions. By allowing developers to design for specific markets, Twitter spotted something else: that we will all need to have choices of tools, just like we do with our email. Oh and by way, don’t forget to follow Mada on Twitter at @madaQATC. Ok so ive been busy and its been a littlew whil since I have written a blog. But I want you all to get as mad as hell, stand up and shout - "I hate web ads with annoying sound effects" Im going to give this Tasbo to two in particular, the first is to the ubiquitous IMVU, I can live with the vaguely distasteful imagery of avatars in romantic clinches, but I cant live with the constant interference with my web browsing by your irritating sound effects, I dont need to have my attention drawn to the page by your noises. I was sitting browsing, a pop up window opened and these effects started. I searched desperately around the page trying to close it, before finding it was hidden a couple of layers down in another window. Just plain irritating. Actually another was worse, I browsed a TV listings page, the same advert appeared in three places on the webpage, everytime I silenced one ad another started its banal sounds. Two of those ads I needed to find by scrolling to the lower section of a page to mute them as they couldnt be seen initially. For those who haven’t come across the concept a while ago I proposed an “Anti award” I guess with a view to naming and shaming, not simply for products or services that were in accessible (there would be too many) but for those vendors, developers, manufacturers etc who seemed to take a deliberate even perverse decision to create something which was more of a crime against accessibility. Tasbo’s are technology anti-social behavior orders, and the first was given to Amazon and the Authors Guild of America. The site in question is http://www.sketch.uk.com/ it is entirely programmed in Flash but that’s just the start of the problems. First up youd better have broadband, and not an Iphone as it’s a large file to load and Apple mobile OS don’t support flash, we are then greeted with a series of animations that are visually confusing and which successfully animate the text on screen. This means that the text that you are trying to read moves as you read it, which includes becoming a mirror image of itself at times ! The worst thing is the restaurant has some great reviews on the web, it’s clearly well thought of a stylish and innovative place to eat, but based on the website you might well decide that it really is just too much bother. So come on guys, im sure you can make it a little easier for me to give you my money because the pumpkin soup sounds great – but I only know that because someone else’s site told me ! Apple are being touted as great computers for the first timer, the touch interface on Iphone and Ipad is ideal for the elderly and those with Learning disabilities, FaceTalk much just be the first video calling application to actually offer lip rading and converstaion signing for the deaf, but this achievement is hugely undermined by lack of empathy with buyers other than the technocracy. Which brings me onto another thing, apple love the opening weekend ploy, queues of people lining up to get the new gadget first, something Futrama have recently lampooned (see http://www.viddler.com/explore/engadget/videos/1633/ if you missed it) and again this gives a message that technology is something beyond the everyday. At the same time as Finland is passing a law saying that broadband access is a legal right, Apple like to suggest that their products are for an elite and who doesnt want to be part of an elite ? I know you can do it - but do you really want to ? 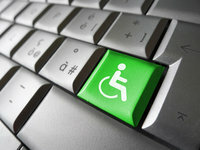 I read with great interest a recent post by Gary Barber on his Blog entitled Kill Accessibility. Its the sort of nicely provocative Blog piece that appeals to me - and unusually for me with my ongoing attention defict, I read it all the way to the end. Gary's piece makes the point that most developers don't really care about accessibility, and moreover pay lip service if they acknowledge the fact at all. He puts this down to the fact that few if any developers are AT users themselves. "You cant take small steps across a chasm"
We need to acknowledge this challenge, we are all aging and have a need for accessibility now or in the near future. Alongside this is the problem of access to Assistive technology. Increasingly then I begin to think that the concept of Universal design is not in itself the solution, that principle needs to be coupled with the integration of pervasive access technologies that operate from within the cloud or on portable and mobile platforms. By building in accessibility not as a set of standards, not as a bolt on but drawn from the internet itself we may have an opportunity to create a network that is intrinsically accessible, the tools and resources that we use would be based upon a core principle of universal access. There is some fantastic work being done in this area, and it is crucial that these projects link closely together, projects like Inredis, AEGIS and Raising the Floor need to integrate not only with eachother but also with the key technology drivers such as Microsoft, Apple and Oracle. It may be that we need to kill accessibility in its current incarnation and look again at where our research, development, energy and funding are going if we are not going to be having this conversation in 10 years time and still saying that for significant parts of the population the benefits of communication, collaboration and community are denied. So lets continue to make a case, companies will understand that there is a market for products delivered via accessible channels, developers may see that self interest and the interests of those around them demand access be made available, but we then need to ensure that the response to this self interest is not simply to try to place a sticking plaster over the wound, or even to try to sew the gaping edges together, rather it is to create a platform which facilitates that universal access. That platform cannot be left in the hands of well meaning but probably misguided folks like me, nor can it be safely left solely in the hands of an Access Industry or Public sector, but instead within a growing ecosystem within which, each has a part to play. What those roles are and how they integrate together is beyond my tiny brain but Im sure that there are others out there with the brainpower to think it through. So perhaps we can't kill accessibility just yet, but maybe as we begin to co-ordinate our efforts in a common direction we might at least be able to put the sheets on the death bed, and take a shovel out to boot hill, just in case. Ok now this is worth a watch - its an important event as the FCC recognised the importance of wireless and mobile technologies for people with a disability. It reflects my own experience in both the UK, europe and the Middle East which suggests that the key battle ground for accessibility is no longer the PC (however much still needs to be done) but is increasngly around portable devices and especially mobile phones. As I leave AbilityNet in two weeks I thought this was a good time to look back at what weve done and the things that im most proud of from that period. Im going to look ahead to the potential of the next stage of my career in another Blog. One of the things in which I take most pride is in the development of teh concept of remote assessment, along with the team, especially Karen Maxwell and Pamela Hardaker we took this from an idea to a whole approach which sought to match services to need. This was enhanced by the development of the online self assessmnet tool and ultimately by the AAC and Easy assessment tools. This suite of tools, which are increasingly hard to find, offer users and professionals a structure by which assessment could take place, reducing the cost of identifying a solution to as little as possible. The success of the concept, was one which I then applied t a range of other ideas. I wanted to explore how we could exploit web 2.0 technologies such as YouTube, Moodle, wiki's etc to reach tens of thousands of people without barriers of geography or cost. The success of that approach should have been clear to all, and my own personal commitment to it is shown that Im still maintaining these types of resources after many years. From an early stage we recognised that AT wasnot enough to bridge the digital divide. Access was reliant not only on having personal technoogy but also on the availability of Accessible digital content. With Robin Christopherson I was able to nurture the growth of the accessibility team from its early days and saw it establish itself as a genuine leader in its field - networked with some of the best in the world. If the web was one network to build, Iwas fortunate also to be involved in building a physical network of locations and partners, from Scotland to Bristol with core resources and partners that would play a big part in the community hubs created through the Swicthed on Community projects. Im writing this in Qatar where I'll be basing myself over the next two years. And that tells you much about those last 10 years. When we started I travelled to Newcastle, Edinburgh and on a really good day Dublin. But over those years AbilityNet became part of a much wider network and as a result I’ve had the chance to travel from one side of Europe to the other - from Turkey and Poland to Ireland - from Greece and Italy to Latvia. Throughout that travelling I was always struck by how the passion and commitment of those who want to bring about digital inclusion was universal. I’ve taken the opportunity to see some of those places as well as work there, the Parthenon in Athens, the last supper in Milan the Warsaw ghetto and Hagia Sofia and the Blue Mosque in Istanbul and I’ve enjoyed them all - and I’ve appreciated the many people I’ve worked with showing me something of the culture and history in which we are trying to embed digital inclusion. So ultimately it has been about the people I’ve worked with. The users of technology and the lives we’ve been able to impact upon. It’s easy to measure success by numbers of people helped. But it’s also important to measure success by the depth of impact on each person we have helped, balancing the superficial aid to 1000 people with the life changing impact on 100 - a balance of both needs to be sought and one loses sight of that at the risk of neglecting those in greatest need. I read with interest the article by Randy Cohen on Gizmodo (see link above). In which he argues that whilst it may be illegal to download an ebook without paying for it, it isnt unethical, as long as you own a copy that you have purchased from a bookstore with money going to author and publisher. In doing so he introduces the moral dimension to what is an increasing acrimonious debate. Publishers are keen to "do a CD" where we all went out and bought music we had already purchased in a new format to take advantage of new players, and equally keep to avoid "doing an mp3" where we noticed we had bought the music twice already and just ripped or downloaded it to a new device. Complicating this debate is that despite the reduced costs of distribution and production of ebooks as compared to both hard and softcover books, publishers are determined to squeeze every drop of blood out of the techie book buying market in a bizarre attepmpt to re-enact scenes from classic horror novels - but with more screaming. Itnot even as if we get the added features of DVD's that sort of convinced us it was ok to update our VHS collection, we get a couple of mb of data to read at our leisure. So in my view its ok to go into Tesco, buy a top 20 paperback and then have an electronic copy available - ESPECIALLY - if the print copy is not something you can use because becaise you have a print disability. its not ok for publishers to offer special schemes where those poor disabled people can be tested to make sure they are disabled enough to have discounts, its not enough for publishers to claim that ebooks have to be this price to support investment in new technology - they have to produce electronic versions of texts, in accessible formats at a price that anyone can afford. The whole point of books is that they are universal, something anyone can access regardless of time and place - as new technology offers increased universal access to reading we need to make sure that we pay a fair and reasonable cost for usage - regardless of format. Now hear me out, but let's be honest, quite often accessibility is a bit boring. We are all well meaning people and committed to social change and all that stuff. But when it gets down to it, when you really get down to it, we are all just a little bit geeky. Im sure that when the creators of "Big Bang Theory" were seeking inspiration, at some point someone said have you tried following these people on a11y threads. The writers must have looked at us and said "oh thank you god thats the first series in the can"
So its time to have some fun. Ive written before that we needto rethink the language of accessibility if we are to gain widespread popular interest. One of the areas to consider is the term assistive technology. Assistive isnt a real word. Where else do we see that term ? Its one we made up in once upon a time, not really expecting anyone to ever actually use it. My definitions recently have become increasing vague culminating in "stuff that helps people do stuff" which even by my standards is a trifle imprecise. Why is this great, well because it takes us into a whole new world of popular litigation. The Geeks Vs Stephen Spielberg. We can take that iconic amblin logo and revamp it as a guy in a wheelchair, with a guidedog in a basket watching a GPS system. Now thats how you find your way home ET. It would be great, and would help us get drinks in bars and get invites to better parties ..... hmmm perhaps my motivation is not altogther altruistic .... but whatever -"accessible but fun" thats my marching call ! As anyone who reads my blog knows, I get irate about stuff. At the moment my pet rant is the cost of hardware. Its not just the cost that riles me, its the comparitive price from specialist suppliers versus mainstream. Disabled users trust the specialists, trust them to understand their needs and recommend a solution that meets those needs. The problem is, that for some items the cost of that service is excessive. On top of that are the reseller arrangements, these deals prevent disabled people from one part of Europe getting the best price for solutions by buying from an alternatative supplier, as t vendor explains that they cant ship across borders etc. So we face a number of issues, is it reasonable to make these levels of markup for product ? Are we using the markup from a low support item to subsidise the costs of meeting the needs of a user with a more complex solution. As we move towards a customer driven AT market, should it be expected that elements of a solution such as support and training are priced seperately for the consumer to choose what they will buy. Importantly here is some transparency and simplicity around the costs of inclusive technologies. As a consultant Im always telling companies that the cost of meeting needs is very small, but if some of the pricing is unrealistic that may fly in the face of their experience.